Jaipur, RUJ Group’s founder and chairman, Dr. Rajendra Kumar Joshi, has been awarded with the Pravasi Bharatiya Samman Award. 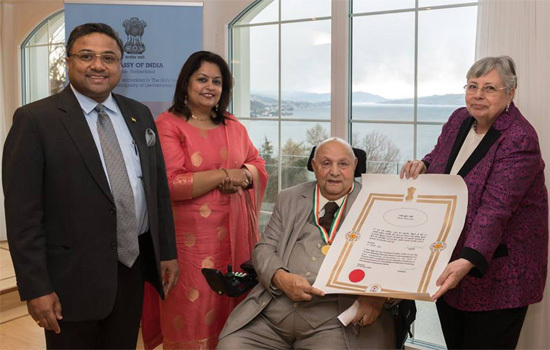 The Embassy of India in Switzerland, on behalf of the President of India, handed over a commendation letter and a medal to Dr. Joshi at his residence. The award was presented to him for his outstanding achievements in the field of science, education and medicine. Dr. Joshi is a scientist of Indian origin who is based in Switzerland and is son of SahityaAkademi Award winner - Mahavir Prasad Joshi. Dr. Rajendra Kumar Joshi is mainly credited for developing path-breaking medicine Tecfidera (BG12) for multiple sclerosis. Tecfidera is sold globally by Biogen Idec and is considered to be a blockbuster product. Tecfidera wins, shortly after medical approval, in the category of primary care and best drug innovation the "Most Innovative Product" award the "Golden Tablet". The medicine has been accorded gold standard benchmark by the FDA. One of the major inventions was also Fumaderm, a medicine for psoriasis, being sold in Germany. Dr. Joshi has more than 300 drug patents against his name worldwide against some of the most feared diseases around the world. Apart from this University, he has invested in diverse trades, namely RUJ & SRM Mechanics Pvt. Ltd. (RS India) – A Precision Parts Machining and Mechanical Assembly Unit, Rajendra and Ursula Joshi Food Industries Pvt. Ltd. (Rufil) - a food and dairy processing unit, RUJ Woodcraft Pvt. Ltd. – a premium furniture manufacturing unit, RUJ Elecon Pvt. Ltd. – a B2B business to deploy turnkey electrical projects, RUJ Hospitals Pvt. Ltd. – Multi super specialty Hospital. So that once skilled, students may either join one of these industries or join other companies of their respective trades. Students are trained to the point that after the course, they may even become an entrepreneur themselves and run their own ventures.Dr. RajendraJoshi, is a visionary and a strong believer in his dreams. He dreams of the Nation and works towards bringing reforms for the development. He is a nation’s pride.